We’ve taken our two leading edge products and created an unparalleled flooring solution! Gone are the days of having to choose between comfort and customization. 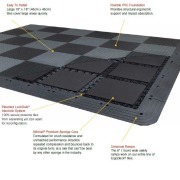 Introducing a modular tile that takes flexibility, performance and safety to the max - ErgoDeck® MAX. 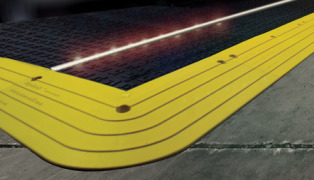 We joined together our innovative ErgoDeck® modular tiles and our proprietary Nitricell® premium sponge, to create a modular floor tile system that provides superior rebound for your Industrial Athletes.Safety, productivity, morale are all important factors in manufacturing facilities, making ergonomics a high priority. ErgoDeck® MAX combines the best in anti-fatigue with the strength of ergonomic structure, to make the ultimate product! Our greatest innovation to date, offers structural support AND impact absorption for healthier and more productive employees, even in multi-shift operations. ErgoDeck® MAX is best suited for dry environments, anywhere workers stand on hard, cold, unforgiving floors.